Much before the term standup comedy was known to Indian audiences, there was one individual who had mastered the art of standup and has been enthralling audiences ever since with his wit and spontaneity. The man was an instrumental part of some of the most entertaining Hindi films ever made and his mere presence would always bring a smile to our faces. The person in question is none other than actor and standup artiste Johnny Lever. For those who have loved and followed Bollywood like yours truly, Lever has been an instrumental and indispensable part of it. His roles in Hatya, Baazigar, Judaai, Dulhe Raja, Anari No. 1 and several other Hindi films are still recalled with affection by his fans and audiences. It is not often that one gets to witness the man live in action, especially of late when he has been doing very few shows. So when I heard about him doing a live performance, there was no way I could have missed it. Accompanying me for the live show was fellow MAM author Aditya who is a self confessed fan of Johnny Lever. On another note, don’t we all love him? The announcement for the Johnny Lever Live show itself is a laugh riot which asks audiences to get ready for unlimited laughter. The show starts with a musical piece containing famous dialogues from various Johny Lever movies including his famous dialogues from Judaai. The show starts with host Dr. Sumesh Shinde who does mimicry of several stars. I particularly liked his mimicry of Hrithik Roshan and Aamir Khan. Shinde’s enthusiastic and lively performance sets the stage for an exciting and entertaining show ahead with the much awaited act of Johnny Lever following it. 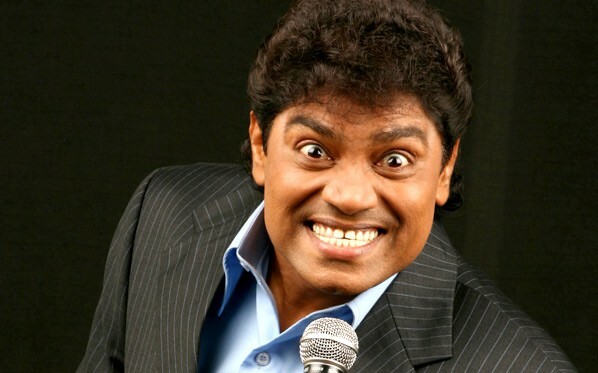 Johnny Lever begins his act by addressing his audience as artists. It was indeed surprising to see an artist like him, requesting audiences to switch off their mobiles with such grace and sarcasm, and one cannot help but laugh at it. Hopefully, better sense will prevail among audiences (especially those seated in the front rows) to do so and understand that it’s a live show and not a movie which they are watching and the bright lights of their smart phones can indeed annoy and distract performers. Though the Johnny Lever Live show is promoted as standup comedy, it goes beyond being a mere standup comedy show. I am sure many people would have laughed and cried at same time, when Johnny Lever mentions about his first performance in Shanmukhananda Hall in Mumbai. In a super sensitive country like India, poking fun at any communities is like dangling a double edged sword. Johnny Lever pokes fun at every community be it Malayalees, Gujaratis or Bengalis. Yet it is to his credit, that none of it feels forced, crude, crass or offensive. A major part of the show is dedicated to how our lives have become fast paced, yet we are increasingly becoming more paranoid thanks to the omnipresent social media, mobile phones and our obsession to stay update with everything. The Dance act by Johnny Lever just before the interval of the show is one of the highlights of the show, which includes a fantastic impersonation of veteran choreographer Saroj Khan and her famous dance moves. It is hard not to be mesmerized by Johnny Lever’s fantastic dance moves during this act. The second act of the show begins with the performance of Jamie Lever, Johnny Lever’s daughter. As a member of the audience I was spellbound by her singing skills, I hope she releases an album soon. She also does a fabulous mimicry of Kareena Kapoor and Hema Malini among other famous actresses. The final act of Johnny Lever in the show mixes comedy with old school emotion as fellow author Aditya rightly pointed out. During this act, he makes us laugh our guts out before ending it on a strong emotional note, which leaves a lump in our throats. It showcases the range of Johnny Lever as an actor, which we sadly don’t get to see often on the screen. Over all, the Johnny Lever Live show is an entertaining and fun filled affair. If you do get a chance, then do watch this show live, for the simple fact that we all are guilty of not giving this talented artist his due and to experience the energy of this artist par excellence. It is one of the most funny and beautiful things you will ever experience. Watching Johnny Lever live should be on every one’s bucket list.